Are VPNs legal ? Why some countries ban virtual private networks ? In which countries VPNs are illegal? All answers are here. Virtual private networks, or VPNs, are a remarkable piece of technology, as they don’t only allow you to browse the internet without being tracked, but also give you the chance to experience the web as seen from another country. Those who have never tried connecting over a VPN don’t realize the joy of seeing a totally different YouTube, Instagram, or Netflix when you connect to a server outside your country. The sensation is second only to actual, physical, traveling abroad. Sadly, this is not a sentiment shared in all corners of the world. Are VPNs legal in all countries? No. While there are some countries that try to monitor the use of VPNs, there are eight countries in the world where this service is punishable by law. When discussing the advantages of using a VPN and the places from which security concerns come from, most serious discussions include the threat that comes from governments. Governments like being in control of their citizens and some government are more focused on keeping that control than others. Connecting to a VPN means freedom to move your computer across the world virtually. With premium VPN providers like Le VPN, you can transfer yourself to 114 countries in a few seconds with a simple app, and there are some countries that don’t like this fact. Not one bit. Why Some Countries Ban Virtual Private Networks? The power internet in general grants to people is so vast and incalculable that literally billions of dollars, euros, yens, and yuans are spent to try to monitor and control these streams, at least partially. Developing countries are the ones that have seen the greatest social impact of the internet, as millions are pulled out of poverty by working online for a client across the world. This creates a problem for governments who want to be the sole provider and protector of their citizens and thus to make them dependent. Authoritarian states fear the fact that they will not be able to lie to their citizens how theirs is the best country in the world, as it is not that difficult to Google Switzerland. And then those people will ask ‘’Well who is the great and beloved ruler of Switzerland?’’ And the answer is no one, no king, no president, no prime minister, just a moderator. That is a bad piece of information to proliferate in countries that have autocratic rulers who reign for decades with an iron fist. How do these Bans Work? Excluding a few places like North Korea where they work by default because the actual internet access points are few and heavily monitored, they usually don’t work at all. If you are caught using a VPN in public, you might be reported in places like Turkey and Iran, but even in countries where VPNs are illegal, it is very rare that someone would report you for using a VPN. In all of the countries where VPN use is illegal the main tool of the government is fear, as they spread propaganda how it is easy for the government to see who is using VPN and they have already made multiple arrests under suspicion or terrorism. This is usually nowhere near the truth as cracking the encryption tunnel created by a premium VPN is next to impossible. Finally, one of the options for government to block VPN usage is to start blocking the IP addresses that come from servers that host VPN machines, which is again very hard to do as the addresses can be changed faster than the government can block them. If you use VPN, you may have free VPN servers from ‘’only” 114 countries, but each nation will house multiple servers that can be chosen at will. While we have no way to know are VPNs legal in your country, and it would be wrong for anyone to entice you to engage in any illegal activities, use this advice only as to access the best possible VPN service regardless of your country. It is sound cybersecurity advice that you will need to keep your physical identity hidden if you want to use your VPN safely and freely. Thankfully, while a few countries declare VPNs illegal, even their neighboring countries usually do not. To have the best VPN experience, you will need to find an optimal mix of security, latency, and open internet. Additionally, you will want to create an anonymous email address that you will use online, as having your name in your public email address can be a safety hazard, especially if you are living in a country that doesn’t look kindly to VPN connections. The biggest trap of VPNs is using a bad server that is basically a proxy but calls itself a VPN. To ensure your safety, you will need to use the best VPNs that aren’t subsidized by a larger corporation. Select companies that have a good reputation and that utilize all of the newest security protocols. Latency is the time it takes to get an answer on your request from the server you are connecting to. While the speed this request travels with is literally the speed of light, it is not instant, and even a latency of several seconds can frustrate you and ruin your experience. To get the best results, you should select a server that is as close to you as possible. For instance, if you are a Le VPN user in Turkey, it is much faster to use the Bulgarian server, or the one on Cyprus, than to use the one based in the US. Finally, the question where you want to connect is the question of what you want to access. While very few countries outright ban VPN services, there are quite a few that restrict some pages for various reasons. The company that has the ‘’freest internet’’ is Iceland, but most others will have all of the content you need. If the server that is closest to you doesn’t allow access to the content you want, you can sacrifice a couple of milliseconds of latency to choose the one after that. Although not all states in this list have the same punishments for people who just want to use the internet anonymously, this is truly a sad list to find any country on. Some of the countries listed have fines, some have more severe punishments, and some have only stated that the use of VPNs in the country is illegal but have not done much to enforce that rule. All of these countries have one thing in common; they have an autocratic regime that is frightened that they will suffer the same fate as did the Egyptian government when protests and demonstrations were made to oppose, and subsequently depose the government. It is impossible to mention internet censorship in any meaningful way without mentioning the People’s Republic of China, and the action mockingly dubbed the ‘’Great Firewall of China”. The PRC has a longstanding tradition of oppressing the media, which has translated to banning all sorts of internet services, including that of VPN providers. While any use of a VPN is strictly forbidden in China under the penalty of forced labor, China also has the largest number of VPN users in the world. If you were to ask a political representative in China what are these people doing, you would hear how they are criminals who want to revert the traditions of the revolution. In all truth, most Chinese, as well as people traveling to the PRC, only wish to conduct their business freely and maybe watch some YouTube and Netflix. It may be a sad fact, but Game of Thrones has not deposed any communist regimes so far. It is probably a cosmic truth that all good things must come to an end. After more than 60 years of economic growth and steady development in both human rights and the quality of life, Turkey has spent the last decade slowly sliding to autocracy, and the undisputed reign of the Prime Minister turned President, Recep Tayyip Erdoğan, who has been ruling the country since 2003. Due to the disdain the government feels towards social media, Turkey has experienced several crackdowns on VPN providers and has blocked multiple popular websites. VPN blocking has proven unsuccessful, as most servers were just moved to neighboring countries and continued to work. As mentioned previously, any VPN ban is doomed to fail, meaning that almost all internet users in Turkey are able to connect to a worldwide premium VPN provider, such as Le VPN. While the Iraqi government might have a valid reason for being frightful of anonymous internet access, namely fighting ISIS, their belligerent approach to the issue has created more problems for this Gulf nation than it has solved. At some point, Iraq has even shut down the internet in the country entirely, which has done more harm to the country’s economy and public image than it has to ISIS who have promptly switched to other means of connecting to the internet than the official Internet Service Providers (ISPs). While the government will not punish you for connecting over a VPN by itself, any access to any ISIS propaganda or message boards will grant you jail time. VPN users in Iraq should be mindful to use VPNs discreetly, and to always connect over a hotspot app when they are in public locations. Russia is a very paradoxical country as it has a very freedom-oriented people and a very, well… not a freedom-oriented government. Putin has celebrated the maturity of his regime in 2018 as he has been the leader of the biggest country in the World for 18 years. 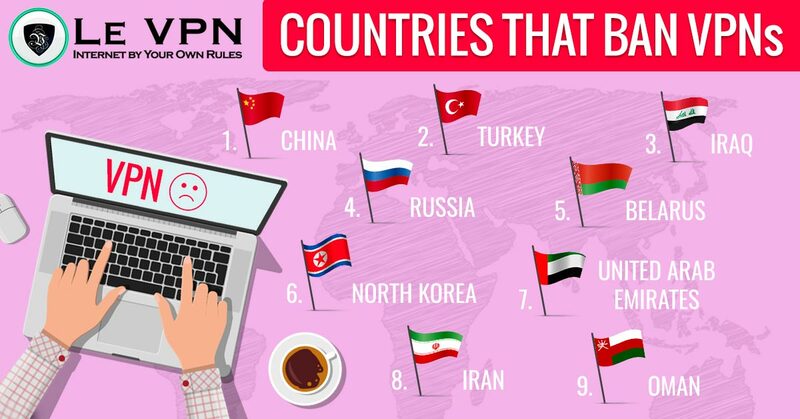 Unlike other countries from this list, Russia hasn’t prescribed any punishments for anyone using a VPN in the country, with the ban only disabling any VPN providers that have operated in Russia. People who are using a Russian ISP can access any foreign VPN, proxy, or any other service. This might change in the future as it is a slight law change, but it is hard to predict both when and in which direction. For the time being, the Russian federation still considered using a VPN illegal. By the time Vladimir Putin ever had a chance to ride his first bear shirtless, Mr. Lukashenko was already the president of Russia’s sisterly nation of Belarus for six years. And that has not changed since. All ISPs in the country are heavily monitored, and all internet access is strictly limited. While it is impossible for the government to know if you are exactly using a VPN, the judicial system in Belarus doesn’t really work on the presumption of innocence. You might be forced to pay the fine of about $120 regardless if they have any real evidence or not, just that you have connected to a foreign IP which the government is not permitting directly. Any list of countries that dabble in internet censorship would be incomplete without mentioning everyone’s favorite hermit kingdom, and when we say, everyone, we obviously exclude the citizens of the People’s Republic of Korea. Any use of VPN in North Korea is strictly forbidden and will cost you incarceration for an unknown period. Unlike all other countries where it is very unlikely that you will ever be seen using a VPN, there are so few internet access points in North Korea that it is almost certain that you will be seen doing anything on the internet, as there will probably be an officer directly behind your back while you browse. As it is quite improbable that anyone in North Korea will ever see this list, it is a good piece of advice for anyone outside who likes modern comfort and technology not to travel to North Korea in the near future. The UAE has a very archaic political system, being one of the few surviving absolute monarchies in the world, and that combined with the Islamic jurisprudence makes for some strange rules, especially when it comes to modern technologies. As the old religious writings say nothing about the internet and the vision of today’s Abu Dhabi or Dubai would probably blow the mind of any person living in that age, VPNs are not strictly forbidden, as much as it is severely punishable if you were to break other laws using a VPN. If you want to know is it legal to visit some page in the UAE, the rule of thumb is to ask yourself would you be fine in showing a child that page. If not, it is probably illegal. This is a bigger problem than anyone from outside of the country might think, as even something basic such as watching Netflix could break religious laws. For instance, if you were to view the 2018 reiteration of ‘’Sabrina the Witch”, you may be flogged for practicing witchcraft. Iran is a hard place to live, as it is experiencing a schism between a very progressive people that have reached Western levels of human rights more than 150 years ago, and a very traditionalist government that is one of the two remaining theocracies in the world, the other being Vatican City. Iran really doesn’t approve of the idea of their citizens being in contact with the wider world and are very strict towards social media in particular. In 2017 it has become popular to use platforms such as Twitter for Iranian women to unveil their hair, which is punishable by jail in the country. As with UAE, you can receive corporal punishment for any kind of action that is against the Islamic religion. Thankfully for the citizens of Iran, they are still able to easily connect to servers such as UAE, which has very low latency and high speed, but they would again fall under similar laws if they were ever to watch Harry Potter online. While the Kingdom of Oman is a Muslim country, they have a much more codified and modernized legal system that predicts specific punishments for anyone in the country using a VPN provider, which is exactly $1000, American. As most ISP providers are supervised, you may be caught if you are using VPN in the country. While you can easily connect to the server in the UAE, there is a high chance of being found out if you are using a regular Oman IP address to access. How to Keep it on the Down Low? While cybersecurity is very important and is only becoming more important by each passing day, we should never forget to protect our physical security as well. Staying inconspicuous and anonymous during your daily life, not seeding your data and private information everywhere you go is the basis of protecting yourself from various issues that may influence your life. Even in countries where VPN connections are legal and easy to obtain it is important to rely on yourself as much as you do on the software. In nations that forbid the use of VPN connection, you will want to be especially careful as not be breaking the rules of the land, or at least not to be caught doing that. Finally, using a VPN is not hurting anyone as it is a protective tool, but it will be troublesome explaining that to governments who are used to controlling almost all aspects of the lives of their citizens. In the information age, it is the duty of every person to protect their personal information, private data, and privacy in general when they are online. For this purpose, using a VPN is the best option, but you must always check are VPNs legal in your country or the country you are visiting. If you feel safe to use this service without repercussions, you should pick out some of the premium VPN providers like Le VPN that has servers in most countries worldwide. The best VPN services not only ensures that you will be protected from hackers and identity theft, but will also protect you from corporations and governments that often want to take a peek on what you are doing and to make you do what they want.